Current targets not enough to stop algal toxins. Harmful algal blooms in Lake Erie can prompt beach closures, like this one in Sandusky Bay, Erie County, Ohio. They also pose a threat to drinking water that is supplied from the lake. The two largest algal blooms ever recorded on Lake Erie occurred in the past five years.Click image to enlarge. Governments in the United States and Canada are working to create new targets for phosphorus loading in Lake Erie to better address the changing drivers of toxic algal blooms in the lake. Draft numbers for the new targets could be released as early as this fall. The Great Lakes Water Quality Agreement, a binational pact to protect the Great Lakes first signed in 1972, limits the amount of phosphorus that can be discharged into the lake to 11,000 metric tons per year. 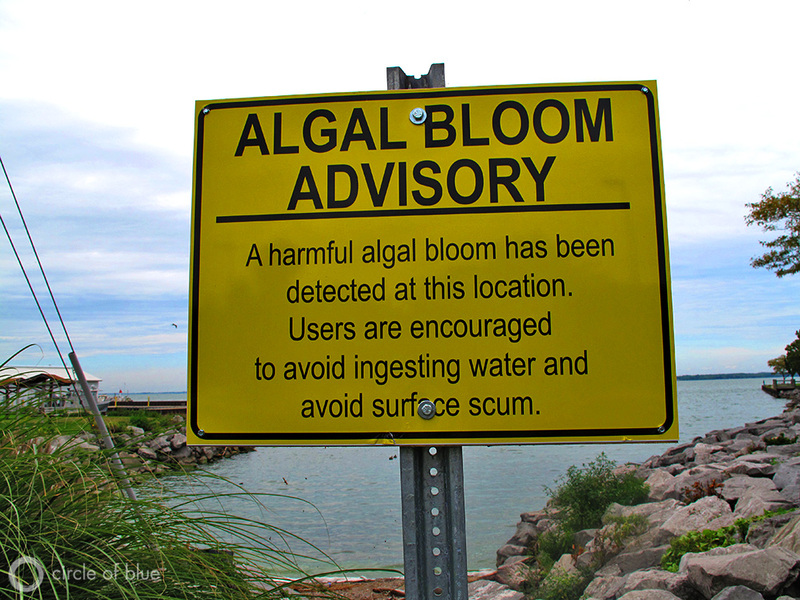 Despite meeting this target for all but five years since 1984, harmful algal blooms have reemerged in Lake Erie, prompting a call for new targets in 2012 when the GLWQA was last renewed. The development of the new targets—and measures to implement them—gained more urgency last week after a harmful algal bloom contaminated the water supply for more than 400,000 people in Toledo, Ohio. In addition, that phosphorus has been coming into the lake in big pulses, with much of it being released between March and June, Bejankiwar said. Once the new targets are approved, the respective state and provincial governments will be assigned to find ways to meet them by reducing phosphorus output. Under the original GLWQA, this took the form of banning phosphorus from detergents and regulating phosphorus discharge from municipal wastewater treatment plants and factories, as well as working with farmers to reduce erosion. Before the GLWQA, the total amount of phosphorus entering Lake Erie each year was upwards of 20,000 metric tons, meaning the countries cut their discharges approximately by half to meet the targets. Recommendations in the most recent IJC report on Lake Erie, released in February, and in studies released by researchers at the University of Michigan, found that similar cuts will be needed to clean up the lake this time. As Circle of Blue reported in February, the studies suggest that total phosphorus coming into Lake Erie’s western and central basins will need to be reduced by 46 percent, and phosphorus coming from the Maumee River should be reduced by 39 percent. The IJC is limited to a research and advisory role, and its recommendations do not have the force of law. Toledo’s drinking water scare, however, has the IJC and many other groups calling for meaningful action. Ideas for regulations—such as banning fertilizer application on frozen ground—have been introduced by a coalition of conservation organizations and Lake Erie business associations. Regulatory bills have not yet been introduced by state or federal legislators. Caddick added that the IJC’s report was an important starting point for these discussions, providing solid numbers about needed reductions.